I began thinking about this story recently while watching an old World Series movie. It was the 1947 Series, Yankees against the Dodgers, and so many things seemed different. I mean, there were still three strikes and you’re out, ninety feet between the bases and nine innings to a game. But so much else about the general appearance of things seemed dated. And I began to realize how changes can creep into the sport without our particularly noticing them. So this is an attempt to back up a couple of decades or so. 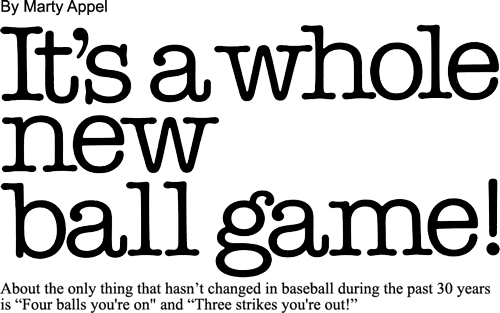 and to recognize some changes, subtle and otherwise, that have made their way into baseball. Two oddities quickly capture attention in that old film. First, there was that old dirt path between home plate and the pitcher’s mound. And then, as strange as it looks today, there were gloves lying all over the field. On a short fly to center, Phil Rizzuto almost tripped over a glove lying right in the middle of the outfield. Baseball outlawed gloves on the field following the 1953 season. Why they were ever allowed escapes me, and why anyone would leave them there is even more puzzling. As for the dirt path, no one seems to know how it came to pass. But by the late ’40s, it had pretty much disappeared from the scene, and by the early ’50s, it was gone. “It died because it was ridiculous to begin with.” says Cleveland Indians’ President Gabe Paul. What else about the ballparks themselves are different? Dodger Stadium, which opened on April 10, 1962, seemed to set the pattern for the modern ballparks, which were referred to as “cookie cutter parks“ a few years ago by a stadium architect. Among other changes, Dodger Stadium was the first to have different colored seats for each tier. And Dodger Stadium was the first to excite fans with the “CHARGE” call over the P.A. system. Dodger fans also helped to set a fashion trend. Reflecting the more casual lifestyle of southern California, Dodger fans attended games in sports clothes. Even in the late 1950s, men still tended to wear neckties and stetson hats to ballparks. At last, the country as a whole tended towards a more colorful and casual look, and when President Kennedy took his hat off on Inauguration Day in 1961, the era of the hat seemed to pass. You can’t talk about stadiums without of course mentioning baseball’s first indoor stadium—the wondrous Astrodome of Harris County, Houston, Texas. The heat of the day in Houston made an air-conditioned facility a necessity, and the Astrodome opened on April 12, 1965, replacing Colt Stadium. But no sooner did it open than the roof caused obvious problems—first glare, and then, dying grass. Spec Richardson ordered the roof painted to cut down the glare, but that certainly didn’t help the grass problem at all. Artificial turf is certainly a major change in baseball stadiums, and the Cincinnati Reds, entering Riverfront Stadium on June 30, 1970, were the first to have just cutout dirt areas around the bases instead of a full dirt infield. Although it helped zip a lot of ground balls through over the years, batting averages have not shown a great change since artificial turf was born. Shea Stadium was the first park to eliminate light towers, by placing rows of lights along the top of the upper deck. And even before Shea opened, Mets’ fans brought a new look to baseball by inundating the Polo Grounds with homemade banners. The Giants, at Candlestick Park, were the first team to have a dugout that wasn’t “dug out,” or lower than the playing field. Riverfront Stadium was the first to put outfield dimensions in metric units, and the Kingdome in Seattle put its dimensions in fathoms, in keeping with the Mariners image. Scoreboards have certainly come a long way since young men hung numbers on hooks, as Bowie Kuhn did in Griffith Stadium, Washington, DC, as a youngster. Yankee Stadium, in 1959, had the first message board, a panel eight characters wide and eight lines deep. In 1960, Bill Veeck put life into the Comiskey Park board, creating a light and fireworks show. That was the forerunner of the sophisticated Astrodome board (1965), the first to use animation in lights. And in 1976, new Yankee Stadium and old Fenway Park became the first baseball parks with instant replay boards. The Yankees found that they missed their old-fashioned out-of-town board, and added another section, two years later. Aside from stadiums, the appearances of players have changed. The major difference seems to be the tight, tapered uniforms, all of knit material, worn today. This was not an overnight change. It goes back to 1960, when Willie Mays had his uniform carefully tailored, in keeping with a changing, fashion conscious time. While Mantle and Man’s were blasting homers on the east coast in baggy uniforms, Mays was blazing new style trends on the west coast. And here comes Charles O. Finley. You didn’t think we could do this story without Charlie O., did you? It was his innovation of colorful green and gold uniforms on the Kansas City Athletics in 1962 that turned baseball fashion inside out. Again, it wasn’t overnight. Teams remained in white and gray through most of the 1962 with the exception of the White Sox powder blue road uniforms. But Finley was blazing a trail. In 1965 he had his manager and coaches wearing white caps. In 1967, he introduced white shoes. And of course, the A’s catching gear was properly color coordinated with green shin guards and chest protectors. One of Finley’s most exciting players was Ken “Hawk” Harrelson. Perhaps more than any other player, Harrelson influenced the style of today’s player. 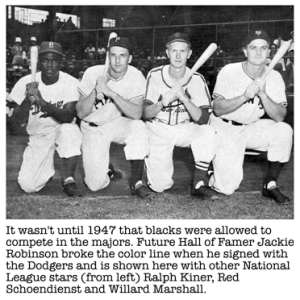 Hawk was the first to wear a batting glove, or golf glove at the plate. As early as 1949, when golf pro Danny Lawler gave Bobby Thomson a glove, players used gloves in spring training or in batting practice. Harrelson though, by 1964, made it standard equipment during the regular season. Harrelson also introduced sweat bands for the wrists (“you don’t realize how much you can sweat in Kansas City“), lamp black under the eyes (“strictly cosmetic—got it playing football“), and high stirrups, exposing mostly the white sanitary socks, and showing little of the team colors. Harrelson also brought long hair into the game, or what we thought at the time was long hair. This was a reflection of the change in the world in general, fallen under the influence of the Beatles. 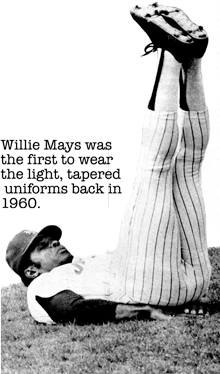 Even more than the long hair, the high stirrups seemed to disturb the baseball establishment. When Harrelson went to Boston, Tom Yawkey hated them. One day, he stopped in the Red Sox clubhouse to chat with Hawk, and Harrelson brought the subject up. “I understand you don’t like the stirrups worn high,” said Harrelson. “Hawk, if you feel that you want to wear them that way, you go ahead,“ replied the Boston owner. And from that day on, as they say, . . .
Harrelson was also the first significant free agent in the game, but more on that later. Suffice it to say, he had a nine year career with a .239 batting average, but really left his mark on the game. Joe Pepitone left his mark too. Joe received a great deal of national publicity in 1968 when he used a hair dryer. He was the subject of a great deal of laughter, but when the new Yankee Stadium opened in 1976, each locker had an outlet for a hair dryer. Branch Rickey is the father of the batting helmet. His own company, American Baseball Cap, manufactured helmets of fiberglass and polyester resin invented by Ed Crick and Ralph Davis of Cleveland. In 1951, Rickey gave one to the Yankees’ Phil Rizzuto. The players then used to joke that the sight of Rizzuto in a helmet made Joe DiMaggio retire. On September 15, 1952, the Pittsburgh Pirates were outfitted with the helmets, becoming the first team to use them. After a few years, the Pirates abandoned the full time use of the helmets, and wore them only at bat. 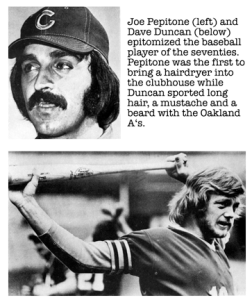 Some players wore only hard liners in their caps, and that faded into history when Norm Cash retired from Detroit in 1974. The ear flap, a Little League innovation, worked its way into big league baseball when Brooks Robinson decided he’d been hit in the head once too often. Brooks also had the brim of his helmet cut to about one inch, an idea that didn’t catch on with others. But the flap over the ear is now used by half the hitters in the majors. 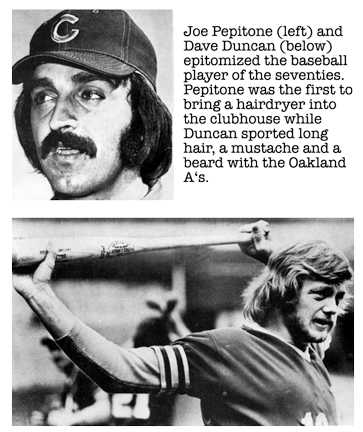 Mustaches are a fairly new look for players, although a throwback of course, to the early days of the game. The current trend was begun by Reggie Jackson of Oakland in 1972. The growth prompted Charlie Finley to offer any player on his team $300 to grow one, and by World Series time, 19 of the 25 A’s were wearing them. Jackson also became the first modern player to grow a beard during the baseball season. Bats haven’t changed too much over the years, and, thank goodness, we haven’t yet been subjected to the piercing sound of aluminum bats at major league games. But we have had a change in color recently. Black bats, or ‘hickory finished” as Hillerich and Bradsby calls it, were used by Rogers Hornsby, among others, in the 1920s and 1930s. But the style faded away and was brought back in 1975, when Pat Kelly of the White Sox began using one. Today, George Foster is the best known advocate of the dark wood. The cup ended, or “hollowed out“ bats were actually introduced in Japan, and “discovered” there by Lou Brock. But it was José Cardenal of the Cubs, in 1976, who became the first player to order his Louisville Sluggers so designed. The theory is that the weight is better distributed into the “meat” part of the bat. Speaking of bats, it was a Loren Babe model that Mickey Mantle used in Griffith Stadium when the term “tape measure home run” was born. 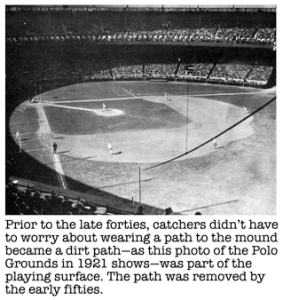 The date was April 17, 1953, and Yankee public relations director Red Patterson measured it at 565 feet. The credit for Bat Day, the game’s most popular modern promotion, goes to Bill Veek’s righthand man, Rudie Schaffer. And the credit for making Old Timer’s Days an annual affair goes to Hall-of-Famer Larry MacPhail, back in 1947 with the Yankees. Baseballs were always made of horsehide, and always made by Spalding, until 1974 when cowhide became the material, and 1976 when the Rawlings name replaced Spalding on the balls. Remember those hitters in the on-deck circles swinging three or four bats? That day is gone, too, thanks in part to Elston Howard. Back in 1967, Ellie and a partner named Frank Hamilton, came up with a concept for a batting “donut,” tapered on the inside to fit snugly on a bat and serve as a convenient bat weight. After the 1967 season, Howard and Hamilton took a booth at a sporting goods show and sold 15000 of them. In spring training of 1968, when he was with the Red Sox, Ellie distributed them among big leaguers, and the idea caught on quickly. Incidentally, one of the first players to adapt it was Ellie’s Boston teammate Hawk Harrelson. 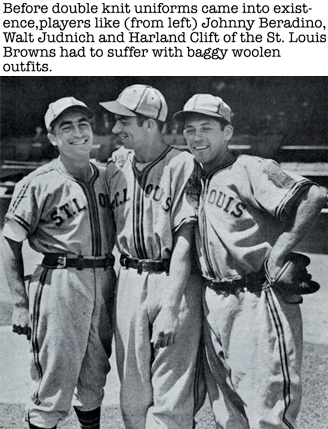 Bill Veeck gets the credit for putting names on uniforms. He did it in 1960 with the White Sox, and it is most memorable for the Z in Kluszewski being sewn on backwards. Knit uniforms, made lighter and more comfortable than the orlon-wool blend, first appeared on the backs of the Pittsburgh Pirates on July 16, 1970, the day they moved into Three Rivers Stadium. By 1972, every team in the majors was wearing knits, except for the Yankees and the Giants who converted a year later. The Pirates also brought back the square baseball cap design in 1976, as a tie-in to the National League’s centennial celebration. Thus far, the Pirates are the only team wearing the square shape. Paul Dade of Cleveland donned uniform number ’00’ in 1977, the first departure from the norm in that department over the last few decades. Al Oliver of Texas wore ‘0’ in 1978, but most likely saw it as a letter—’0′ as in Oliver. Steve Yeager gets a mention for his 1977 innovation of a flap on the catcher’s mask—sort of the “King Tut look.“ The flap was designed after Steve was struck in the throat by a flying bat the year before. Johnny Bench began a style of a chest protector that fastened at the neck and waist, and had no straps running down the back. And the oversized catcher’s mitt goes back to 1958, when Oriole’s manager Paul Richards created the monster glove for Gus Triandos to handle the knuckle hall of Hoyt Wilhelm. Remember the “men in blue?” American League umpires went to grey pants in 1967, and in 1969 were permitted to remove their ties and jackets on hot days. In 1971, they were issued red blazers, and the “men in blue” existed in name only. Television cameras on the field are a relatively new look, and one thing that television brought to baseball was prime time All-Star games and World Series. Finley is the one baseball man who kept speaking out for night action, and the first night World Series game ever played was the fourth game of the 1971 classic, Baltimore at Pittsburgh. The first night All-Star Game was played on July 11, 1967 in Anaheim, and NBC remembers it well. It went 15 innings, and bumped their special on Nikita Khrushchev well past 11 p.m. eastern time. Can you remember when baseball was played by nine against nine instead of ten against ten? Ron Blomberg of the Yankees was baseball’s first designated hitter, going to bat in the first inning in Boston on April 6, 1973. And Herb Washington, considered baseball’s first “designated runner” (but actually just a pinch runner), got into 92 games in that capacity with the 1974 Oakland A’s without ever getting to bat. Okay, let’s talk money. This section doesn’t really affect how baseball looks different on the field, but it has certainly made players better dressers off the field. Here are some firsts: the first $100,000 “Bonus Baby“ was pitcher Paul Pettit, who signed with the Pirates in 1950. 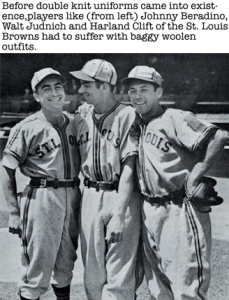 Pettit wound up winning one game in the major leagues. The first $l00,000 salary. generally believed to be Joe DiMaggio’s, is claimed by Hank Greenberg with the Pirates of 1947. The first free agent selected in the June, 1965 draft, the first ever held, was Rick Monday of Arizona State University, signed by Kansas City. The first player selected in the re-entry draft of November, 1976, was Reggie Jackson, by Montreal. He later signed with the Yankees, of course, while Bill Campbell became the first player to sign through that system, joining the Red Sox. The first player ever selected in an expansion draft was pitcher Eli Grba of the Los Angeles Angels, taken from the Yankees in 1960. The first player in modern times with an agent, other than his own family lawyer, was Earl Wilson in 1966. His agent, who prefers to be called a sports attorney, was Bob Woolf, and he created the “deferred payment“ concept that year with Detroit. Although Harrelson denied the statement (“I said he was bad for baseball“), Finley was so mad that he just released Harrelson in mid-season. He probably could have sold him for $50,000 or so, but his anger got in his way. Harrelson began receiving calls from other teams, and soon signed with the Red Sox for a reported $75,000 bonus and a two-year contract worth some $100,000. He had been making $3,000 in Kansas City. Let us not forget that if you look at a team photo today, and one of 35 years ago, the biggest difference is the appearance of the black players, and the impact all that talent has had on the game. 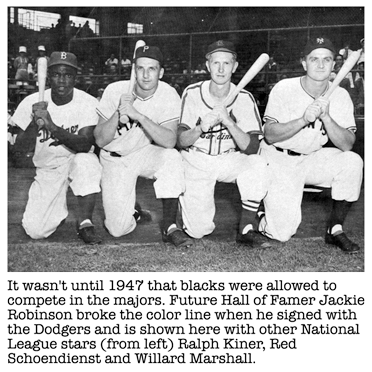 So here is the rollcall of the trailblazers among blacks, since Jackie Robinson opened the door as the first black player in 1947, probably the most significant development of modern baseball. The first black coach was Jim Gilliam of Los Angeles in 1965. The first black umpire was Emmett Ashford of the American League in 1966. The first black manager was Frank Robinson of Cleveland in 1975. The first black general manager was Bill Lucas of Atlanta in 1977. And how about this one—the first all-black starting lineup—it happened in Pittsburgh on September 1, 1971, when the Pirates had Al Oliver at first, Rennie Stennet at second, Jackie Hernandez at short, Dave Cash at third, Willie Stargell in left, Gene Clines in center, Roberto Clemente in right, Manny Sanguillen catching and Dock Ellis pitching. How about Dock Ellis for the first black commissioner? Let’s mark a place in history for the 1969 Atlanta Braves and Minnesota Twins—the first teams to lose a championship series, and to the ’69 Mets and Orioles, the first teams to win one. Divisional play began that year. Pine tar rags, bullpen cars, automatic tarps, ballboys, ballgirls, base sweepers, water displays—the list can go on and on, and will continue to change as time passes. Maybe we’ll all pay just a little more attention from now on, and try to attribute due credit whenever possible. 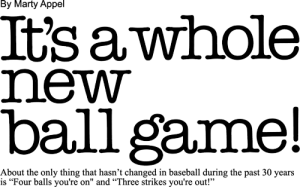 As much as baseball prides itself on its 100-plus years as the grand old game—it’s changing all the time.